It appears new calendars in iCloud created in Fantastical 2 aren’t synced in Agenda until you leave Agenda and reenter. Thanks for the detailed steps, we’ll have a look if this can be improved. Can you show more context in this screenshot, I don’t see where you see that. If I click the calendar icon in an event, it only asks me to link an event, I don’t see the ‘Show Event in Calendar…’. Thanks. The app certainly should not crash if you have no calendars available, we’ll fix that and instead warn you. This crash has been fixed in the 1.4 update. 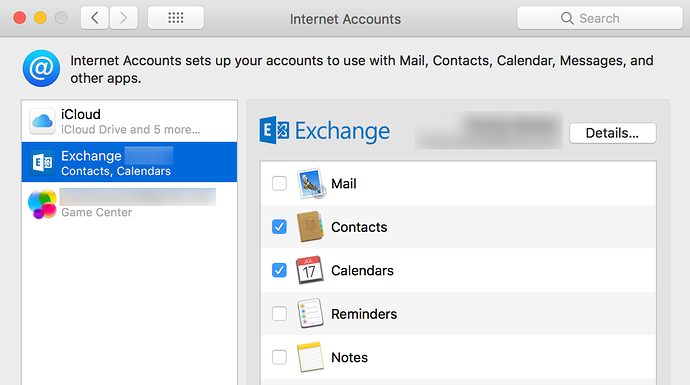 For work I’m using Microsoft Outlook on a Mac and would like to access my outlook events from Agenda. This works. If you need some help to set it up, let us know. Yes if you could provide some hints that would be great. As a note, my out Outlook sync with Microsoft Exchange not Office365. Setup your Microsoft Exchange account in System Preferences > Internet accounts as shown below. You may need to create an app password for your Exchange account if you have multi-factor authentication enabled. Hi there, this thread was immensely helpful to me, especially the screenshots on setting the default calendar in the Calendar app itself (I might not have figured that out on my own). I use BusyCal, so I set this up before I connected Agenda to my calendars and it worked flawlessly. Now that iOS app is out, is there a similar process to follow on my phone before I connect my calendars to ensure everything runs smoothly? I also have the BusyCal app on my phone, but don’t see any obvious way to tell my phone that BusyCal should be default. I got same question here, except my default calendar app is fantastical 2. It works perfectly with agenda on my Mac, but I still can’t get it work on my iPad and iPhone. Is there anyway to make third party calendar app as default in iOS? Thx for any suggestion. Thank you! Another BusyCal user here. Using Agenda in iOS do you/can you use Outlook as third party calendar app with Agenda. work email uses the outlook app (i.e. I have no choice of another 3rd party app) so would be great to bring them together. What’s been difficult for me is that I use an android phone. I’d like to link an agenda note to google’s calendar. The problem on iOS is that Apple doesn’t allow you to pick a 3rd party app as the default Calendar app. Agenda does work with Google calendars and Exchange calendars but only if configured through the Settings.app.